How will Iran, Russia, and Turkey react to the plethora of financial sanctions being placed on them by the US? Well, they will do what anyone being beaten with a stick would do: they will try to escape. An escape is always available. That is one reason why sanctions are weapons used only by losers. Indeed, the escape has been dubbed — by my good friend, mentor, and Nobelist Robert “Bob” Mundell — as the “Afghan Effect”. Following the Soviet invasion of Afghanistan, the US imposed a grain embargo on the Soviets in January 1980. With that, American farmers were prohibited from selling grain to the Soviets who had a huge grain deficit. President Jimmy Carter, on the ill-conceived advice of his National Security Advisor Zbigniew Brzezinski, weaponized grain. In response, the Soviets looked for an escape. They found one in Argentina. Indeed, the Argentines were delighted to cut a deal with the Soviets. The Argentine farmers sold large quantities of grain, the Soviets obtained a good price, and American farmers were left out to dry. The icing on the cake (read: Bob Mundell’s Afghan Effect) was the fact that the Argentine military junta was handed an enormous benefit on a silver platter. This brings me to today’s favourite weapon of war: financial sanctions. With each passing day, the US Treasury rolls out, or threatens to roll out, more sanctions. We all know about the sanctions that cover Iran like a wet blanket. We also recently witnessed the imposition of sanctions on Turkey, where the pretence for imposing them was a US pastor who was allegedly not tending his Turkish flock properly. When it comes to Russia, new US sanctions are an almost daily affair. The weight of sanctions has clearly created great difficulties for the Iranian rial, Russian rouble and Turkish lira. Indeed, even in the best of times, these are all half-baked currencies with long troubled histories. They are all vulnerable to sanctions. Indeed, their vulnerability should be viewed as threats to national security. So, how can Iran, Russia, and Turkey escape the sanctions stick? They could make their currencies as good as gold. This would provide an attractive escape. Gold is already an international currency that holds its purchasing power over time. It is also a currency that is not issued by a sovereign. So, it has no political baggage to carry. In addition, gold is already widely revered and used in Iran, Russia, and Turkey. 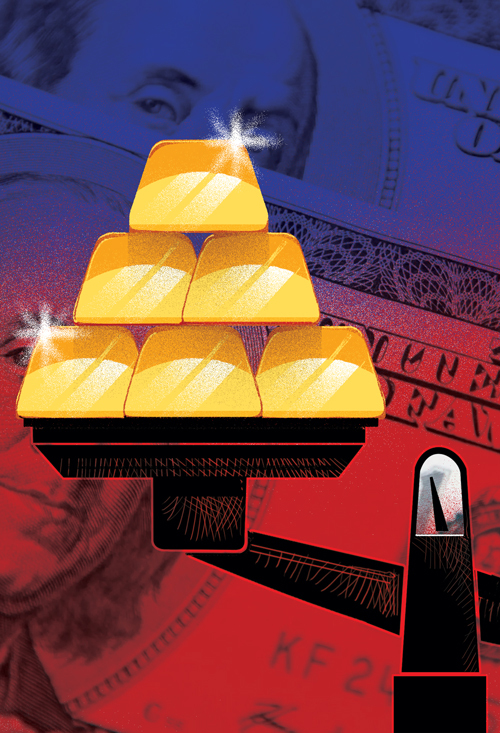 In 1997, Bob Mundell predicted that “Gold will be part of the structure of the international monetary system in the 21st century.” As has often been the case, Mundell’s prediction might just be prescient. Indeed, Iran, Russia, and Turkey could, and just might, make Mundell’s prediction a reality. One foolproof way to do that is via gold-based currency boards. Currency boards have existed in more than 70 countries, and a number are in operation today. Countries with such monetary institutions have experienced more fiscal discipline, superior price stability, and higher growth rates than comparable countries with central banks. A currency board is a monetary institution that only issues notes and coins. These monetary liabilities are freely convertible into a reserve currency (also called the anchor currency) at a fixed rate on demand. The reserve currency is a convertible foreign currency or a commodity chosen for its expected stability. For reserves, such a currency board holds low-risk, interest-earning securities and other assets payable in the reserve currency. By law, a currency board is required to maintain a fixed exchange rate with the reserve currency and hold foreign reserves equal to 100 per cent of the monetary base. This prevents the currency board from increasing or decreasing the monetary base at its own discretion. A currency board system is passive and is characterised by automaticity. Currency boards have existed in some 70 countries. The first was installed in the British Indian Ocean colony of Mauritius in 1849. No currency board has failed. Yes, no failures. Argentina’s Convertibility system (1991-2001) was not a currency board. Currency boards’ perfect record includes the National Emission Caisse, established in northern Russia in 1918 during Russia’s Civil War. The Caisse issued “British rouble” notes, backed by pound sterling and convertible into pounds at a fixed rate. The father of the British rouble was none other than John Maynard Keynes, a British Treasury official at the time. Despite the Civil War, the British rouble never deviated from its fixed exchange rate with the pound. In contrast to other Russian roubles, the British rouble was a reliable store of value. Naturally, the British rouble drove other roubles out of circulation. Unfortunately, its life was brief: The National Emission Caisse ceased operation in 1920 after allied troops withdrew from Russia. The “Great Escape” from US financial sanctions for Iran, Russia, and Turkey would be to establish gold-backed currency boards. By doing so, the rial, rouble, and lira would literally be as good as gold. And from one day to the next, a significant gold bloc would be established. Oh my! Steve H. Hanke is Professor of Applied Economics at Johns Hopkins University.